I have been overwhelmed and touched by all the donations I've collected for the Run for the Cure. Our team, No Pink for Profit, has more than thirty members. I'm - ahem - tickled pink. I've raised $1,558.00, way more than I'd anticipated. And maybe all this generosity and enthusiasm have made me delirious but I've begun to wonder, "what if I could make it an even $2000.00?" What do you think? Is it possible? Want to help? I always think it's going to be different. I say to myself, "This round of treatment, I will exercise and write and continue with my daily routine and see if that makes me feel better." And thent, in the days that follow each dose of vinorelbine and Herceptin, I stay in bed too sick to do anything and lacking the self-discipline (motivation?) to try getting exercise, writing or going about my daily routine. I don't even bother to eat well (although the soup I made the night before chemo was delicious and easy to heat up, so I did eat lots of that) or even do the easy things that might help (I was on the phone with my writing buddy and she asked if I'd been drinking hot water with lemon and ginger. Easy to prepare and she swears by it, yet I had completely forgotten). I don't even drink enough water. I just wait until the weekend when I know I'll feel better (unless I get sick, as I did yesterday and had to miss dinner with friends and my beloved book club). Fed up with losing a week out of every month. Fed up with having to constantly worry about my energy levels and not overdoing. Fed up with not having answers and having to worry. Sometimes I amuse myself (and no one else) by announcing, "I'm done. That's it!" But I don't really mean it. I know where I'd be if it weren't for all the chemo and the Herceptin. And I know that it's worth it. And who knows? Maybe next time will be different. I just learned the very sad news that Christine Lynds passed away last Friday. Chris was a strong, smart woman, who inspired and gave hope to so many people who's lived had been affected by cancer. We shared an oncologist and I appreciated her outlook towards living with advanced breast cancer. I was also more than a little in awe of her. She was active and fit and a true community activist. The first time I met Christine in person, she had brought a posse of women who'd lived through breast cancer to my book launch. The second time I met her, she came to collect a prosthetic breast that I no longer wore so that it could find a new home with a friend of hers. We sat and drank coffee on my couch and talked about our boys and our dogs. I know that she loved to organize people and projects and that she had many loyal friends to whom she was very committed. And I know that there are legions of people by whom she will be sorely missed. Christine's blog was called "The Edge of Light." The world is a little darker without her in it. In her third year of medical training - discouraged by how little focus there was on caring - a young woman was faced with a decision: she could throw her hands up and quit or she could risk speaking up and work toward change. 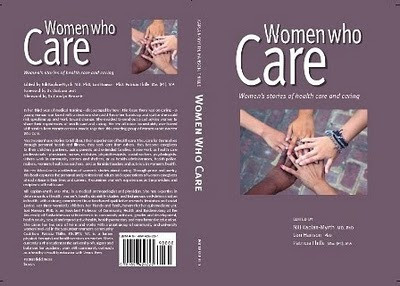 She decided to send out a call asking women to share their experiences with health care and caring. Her e-mail inbox immediately overflowed with stories from women across Canada Together, this amazing group of women wrote Women Who Care. The book was published by Pottersfield Press. I'm proud to say that an essay I've written has been included. It's called "Patient Personified" and it's about how the politics of health care have become intensely personal since I was diagnosed with breast cancer. You can order the book through the publisher or your local bookseller (Octopus Books is carrying it in Ottawa). The books author's will be donating any royalties to the Women's College Hospital Foundation. This year, I am running/walking in the Run for the Cure in support of the Canadian Breast Cancer Foundation and I'm writing to ask if you'd be willing to make a donation. As you know, this is an issue that is very personal for me. In November 2006, when I was told that my breast cancer had spread to my liver, I knew no one who had survived this kind of diagnosis. Even my oncologist reluctantly told me that I had “years not decades” to live. But my response to treatment was immediate and dramatic – by June 2007, there was no longer any sign of cancer in my body. As I write this, I am still in remission. I'm also still in treatment, as we don't know enough about what happens when metastatic breast cancer disappears to make an informed decision about stopping. There is no question in my mind that I am alive today because of the kind of cutting edge research that is funded by the Run for the Cure and the Canadian Breast Cancer Foundation (CBCF). In November 2007, I attended a conference that was funded my the CBCF for younger women affected by breast cancer. In one of the plenary sessions, I stood up and asked how many women attending the conference were also living with metastasis. There were dozens of us. For the very first time I internalized the idea that having stage four breast cancer need not be a death sentence. It's not an overstatement to say that moment changed my life. I support the Run for the Cure because I don't want any woman with breast cancer to feel alone. I support the Run so that more of us with stage four can go into remission and even walk away from treatment with confidence. I support the Run so that no woman need ever fear breast cancer again. And I'm running with Team No Pink for Profit because I hate the corporatization of breast cancer. Our team name makes me feel a little bit subversive. I'm so proud to be the captain of this team comprised more than 30 women and we're the top fundraisers for our region. It gives me great pleasure to see our team name scrolling on the front page of the regional web site. Can you help by making a donation? Any amount would be appreciated.